(*) PLEASE NOTE: This Mercury Capri Front Header Panel / "Nose" Panel has been cut away from the donor car and includes a substantial part of the structure below & around the panel. The customer's body shop can trim the "unit" to best suit their needs and weld it into place. This used Mercury Capri Front Header Panel / "Nose" Panel part is not only significantly less in price than a new one, but I've been told that installing a used "unit is also far less time consuming/costly than carefully removing the old panel and welding in the new replacement. *PLEASE NOTE: These Mercury Capri front Front Header Panel are close to 15 yeas old, and as expected with any used body part, they are not in no way "perfect", and therefore typically need some cosmetic repair; they typically have some surface defects (scratches, peeling paint, prior repairs, some small "parking lot" dings/dents, etc.) which can typically be easily repaired by professional body shop. Therefore as per our stated policies, all "Sales Are Final" and "As Is" on these used Mercury Capri Front Header Panel, as well as all other used parts we sell. 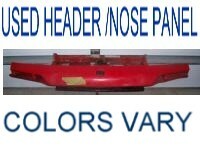 Therefore as All "Sales Are Final" / "As Is", there are no warrentees, guarantees, returns, exchanges, and/or refunds whatsoever on these used Mercury Capri Front Header Panel. Kindly note that any order for body parts is non-cancellable once placed, so please place your after knowingly accepting this policy and only after reading the item description and store policies.